LAUSANNE, Switzerland — The World Baseball Softball Confederation revealed the Official Game Schedule for the U-23 Baseball World Cup® 2018 — the biggest international baseball event of the year and biggest ever in Colombia. National Team rosters are expected to feature players within the organisations of the Australian Baseball League (ABL), Chinese Professional Baseball League (CPBL), Dominican Professional Baseball League (LIDOM), Korean Baseball Organization (KBO), Major League Baseball (MLB), Mexican Baseball League (LMB), Nippon Professional Baseball (NPB), Puerto Rico’s Roberto Clemente Professional Baseball League (LBPRC) and the Venezuelan Professional Baseball League (LVBP), in addition to other leagues from around the world. 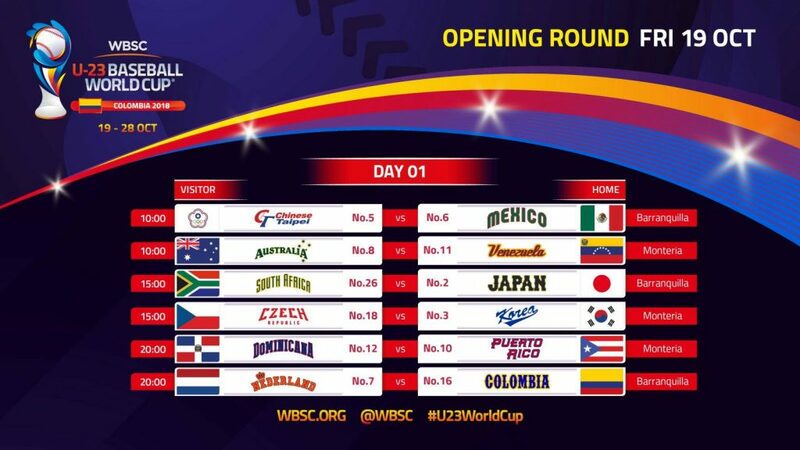 Twelve nations will compete For the Title of World Champion across 50 games from 19-28 October, with Group A games at Edgar Renteria Stadium in Barranquilla and Group B games at June 18 Baseball Stadium in Monteria. Game 1: Superpowers from the Americas and Asia will collide when world No. 5 Chinese Taipei and No. 6 Mexico meet. Game 2: The 2016 U-23 silver medallists, No. 8 Australia, will open against No. 11 Venezuela, the current U-23 Pan Am champions. Game 3: No. 2 Japan, the defending U-23 World Champions, will face Africa’s top-ranked team, No. 26 South Africa. Game 4: One of Europe’s top squads, No. 18 Czech Republic, will battle one of the top-ranked teams in Asia and the world, No. 3 Korea. Game 5: Caribbean rivals and baseball powerhouses — No. 12 Dominican Republic and No. 10 Puerto Rico — will open their world cup tournament together. Game 6: South American host No. 16 Colombia will entertain Europe’s top baseball nation, No. 7 Netherlands. The top three teams from each Opening Round group will advance to the Super Round at Edgar Renteria Stadium, while the bottom three finishers will compete in the 7th-12th Place Round at June 18 Baseball Stadium. The two nations with the best Super Round records will play in the World Championship Final at Edgar Renteria Stadium on Sunday, 28 October, at 19:00. The 3rd/4th Place Bronze Medal Match will be staged at the same venue at 13:00. The broadcast and live-streaming schedule will be announced in an upcoming news release.